California is one big state, stretching for 900 miles up and down its coast. For hundreds of years, it's enticed dreamers for its weather, opportunity and spectacular scenery. From the Gold Rush to Hollywood to Silicon Valley, the Golden State has always offered plenty of appeal. It goes without saying there's a ton of neat things to see and do, whether your thing is beautiful parks, outdoor adventure, kitschy tourist attractions or anything in between. Here are our picks for 20 of the coolest. 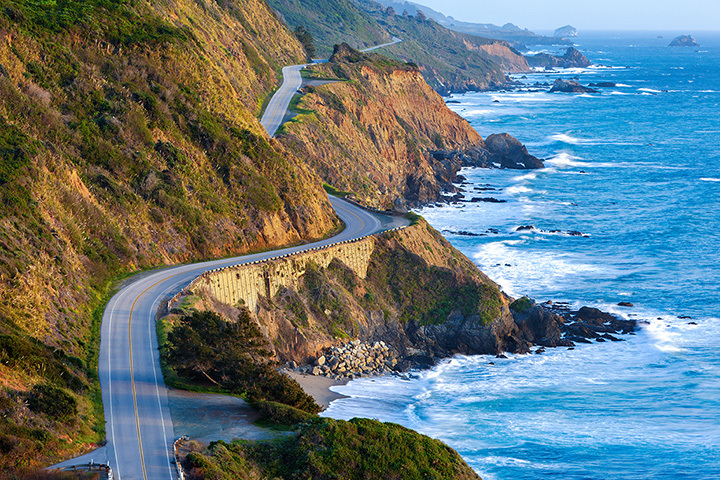 This 90-mile drive along Cali's Central Coast is considered one of the most beautiful routes in the world. Whether it's Carmel, the historic Point Sur Lighthouse or especially, the McWay Falls (80 feet directly down into the ocean! ), you'll be pulling over again and again for scenic photo ops. Talk about making lemons into lemonade: this area of coastline in Fort Bragg was once a dumping ground. But decades of ditching bottles and other glassware has resulted in this freakishly-pretty landmark. Over the years, all that glass has been polished into lovely, rounded bits of sea glass. It's pretty spectacular. General Sherman is the tallest – and among the most ancient – trees on the planet. And it lives in the Giant Forest of Sequoia National Park. The General is 275 feet tall and estimated to be close to 2,700 years old. Wrap your brain around that. It's one of the most iconic parts of San Francisco, looking out over the bay. You can spot fishing boats as they come in, inhale tons of amazing fresh seafood and watch sea lions lazing in the sun. Sure, it's a bit cheesy – but where else can you pay your respects to over 2,500 celebrities, ranging from Mickey Rooney to the Jackson 5 to people you've never heard of? Stroll the 15 blocks along Hollywood Boulevard and see if you can find your favorites. Since 1920, this kitschy amusement park in Buena Park (which was an adjunct to the produce and pies originally sold at the location) has been a favorite among families who want a fun day out. There are tons of rides – 10 rollercoasters alone! Since opening in 1916, it's become one of the best zoos anywhere. In fact, it's been voted the No. 1 zoo in the world, and has won numerous awards for its conservation programs. Pandas, monkeys, koalas, elephants and hundreds of other species all call this wonderful place home. This park is home to three of the world's tallest waterfalls, the granite cliffs of El Capitan and Half Dome, among many other attractions. There's also the glorious scenic overlook, Tunnel View, which gives a breathtaking, expansive view of the valley and has been a must-visit spot since opening in 1933. Before the Orlando behemoth that is Disneyworld, there was the original. First opened in 1955, this was the original home of Mickey and Minnie, and was built under the direct supervision of Walt. So visit the first "happiest place on earth" in Anaheim. Why wouldn't you want to visit (repeatedly) this amazing landmark, considered to be one of the major construction achievements of the 20th century? After you "ooh" and "aah," enjoy the national parks on either end of the span, where you can learn the history of the bridge, walk your pooch and take in different views of the bridge. The RMS Queen Mary, which sailed from 1936 to 1967, is now a floating hotel in Long Beach that offers a unique luxury dining and stay-over experience. The secret sauce? It's considered one of the most haunted locations on the planet. So see if you last the night. The Winchester Mystery House in San Jose was built by the widow of the man who invented the famous gun. She was so freaked out over the prospect of those murdered by the weapon haunting her, that she spent decades adding crazy passageways and dead-ends to her mansion in the hopes that it would confuse them. And you thought you got lost on the way to the bathroom at night. The Napa Valley is home to 525 different wineries. It can all be a little overwhelming, so the Wine Train makes things easier. Beautifully restored, museum-quality Pullman cars take you through 25 miles of wine country, throwing in some amazing fine dining, to boot. Specifically, the Cabazon Dinosaurs. They're the cheesy, prefab versions you've seen in movies like Pee Wee's Big Adventure or in various music videos. An estimated 12 million folks drive past this roadside attraction each year on their way to Palm Springs. Certainly worth a stop for a photo op – and some of 'em, you can climb up into. They're irretrievably associated with the City by the Bay – and one of the most fun ways to see San Francisco. Ride any of the three routes, then stop off at the Cable Car Museum on Nob Hill to learn more about these moving historical landmarks. These beautiful (and important) insects overwinter up and down the California coast, sleeping in the trees. When the sun warms them, huge swarms take flight. It's an amazing sight. While there are several places to witness this beautiful show, the Pacific Grove Monarch Sanctuary (aka Butterfly Town) is among the best. This massive estate in San Simeon owned by newspaper magnate Randolph Hearst was the inspiration for the Xanadu of Citizen Kane. The mansion features 56 bedrooms and 61 bathrooms. The grounds encompass the world's largest private zoo that includes zebras and other exotic creatures. Spend some time browsing this fantastic collection of European and American art. When you're done, enjoy the grounds of the Getty Centre, where you can take in beautiful sculpture, lush gardens and views of downtown Los Angeles. One of the most notorious maximum-security prisons in the country now makes for one heck of a tourist spot. You can visit the former cells of famous prisoners like Al Capone and Whitey Bulger, and get a sense of the desperation that made almost 40 prisoners attempt an impossible escape into the icy waters of San Francisco Bay. It's one of the most recognizable planetariums anywhere, the exterior featured in movies and TV shows. Since its opening in 1935, it offers not just great programs on astronomy, the grounds provide spectacular views of downtown L.A. and the Pacific Ocean.